It seems that anytime a throwing athlete complains of anterior shoulder pain, medical professionals diagnose him with “biceps tendinitis.” Meanwhile, it’s common for some in the baseball world to view pain in the belly of the biceps as innocuous. 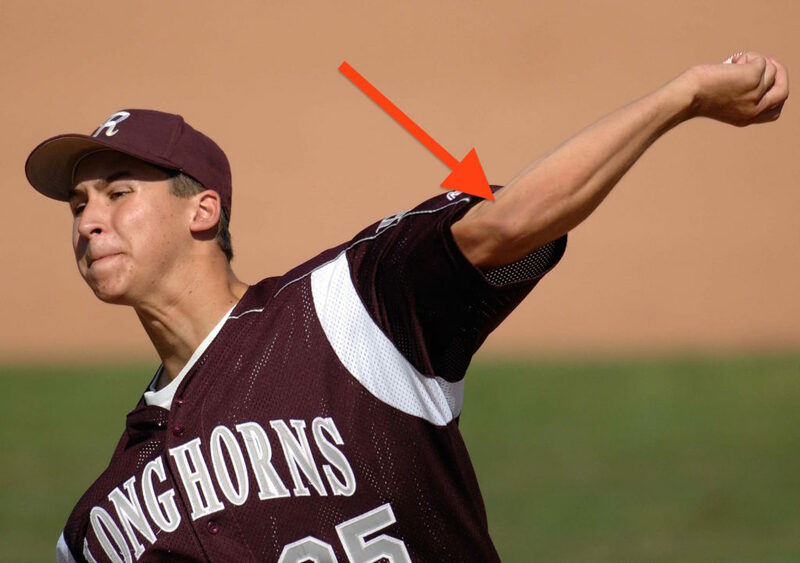 Historically, the role of the biceps in throwing has been misunderstood, misinterpreted, and misapplied. Let’s try and clear things up. Eccentric biceps is the devil for a throwing athlete. 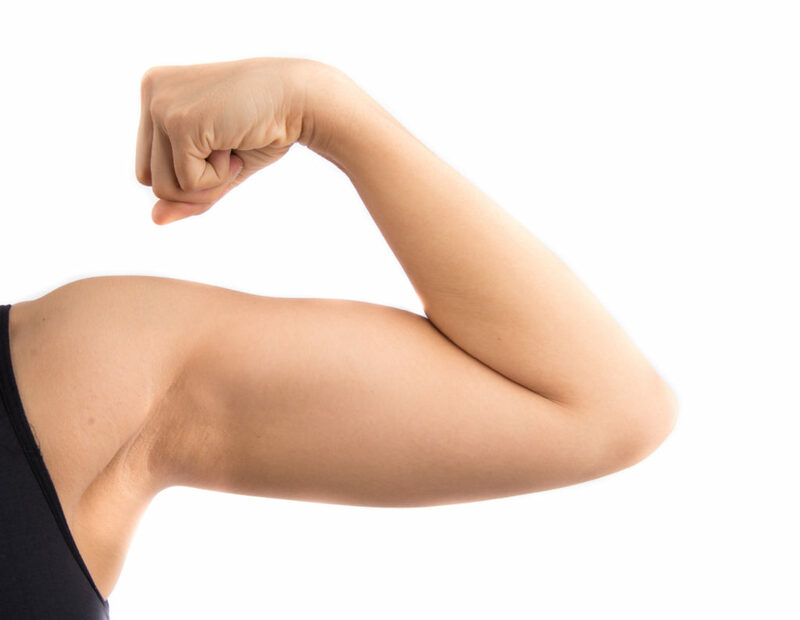 An overactive biceps muscle can be a significant contributor to pain in the belly of the biceps muscle, biceps tendinitis, and can even lead to labrum or UCL tears. However, according to a landmark Jobe et al EMG study from back in 1984 (1), the biceps is relatively quiet during the early cocking phase and even during acceleration. It is, however extremely active at ball release. At this point in the movement, in the untrained shoulder, the biceps is raging eccentrically (lengthening as it produces force). This eccentric contraction (think a negative rep in the gym) produces about 2.5 times the amount of force produced by a concentric contraction. In the typical throwing shoulder, when the ball is released, the posterior cuff and peri-scapular muscles surrender, like a guy losing a tug-of-war. This leaves the biceps virtually alone (it does get a little help from the brachial and brachioradialis) to resist three movements: long axis distraction of the humerus, humeral head elevation, and terminal elbow extension. 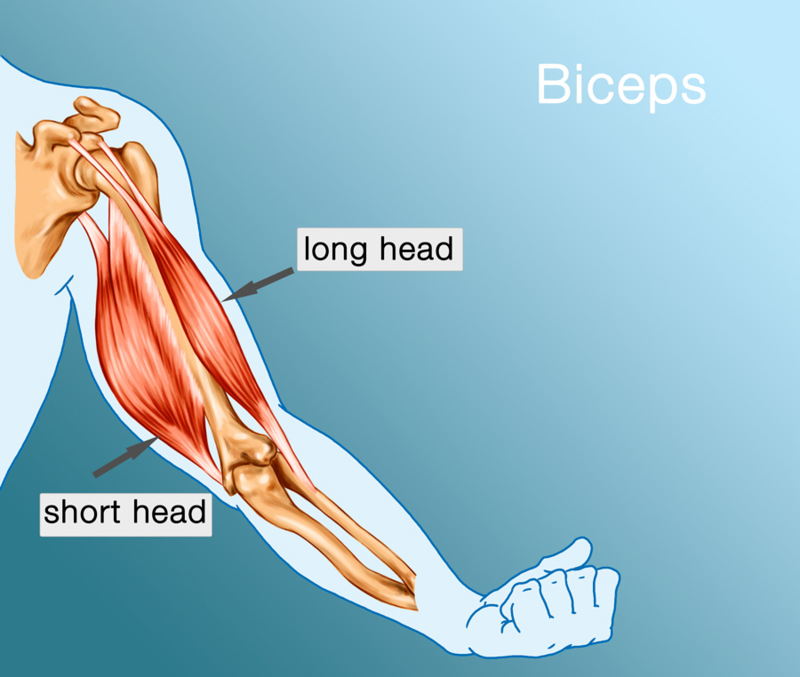 If you trace the anatomy of the biceps up toward the shoulder, it separates into two heads. The short head runs medially (toward the midline of the body) and attaches to a bony profusion on the front of the scapula called the coracoid process. Meanwhile, the long head of the biceps thins and transitions into the biceps tendon, running through a narrow groove on the front of the shoulder. 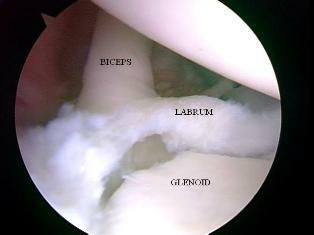 As it continues into the shoulder joint, the biceps tendon inserts into the superior labrum. The labrum is an oval-shaped fibrocartilagenous ring that surrounds the glenoid fossa — the shallow socket that makes up half of the shoulder joint. The labrum provides some depth to the joint interface and provides a suctioning force that helps to stabilize the shoulder, keeping the head of the humerus from flopping around and causing abnormal stresses. It the biceps is left unassisted and remains overactive in the throwing motion, its massive eccentric tug can actually pull part of the labrum off the glenoid fossa. This is known as a SLAP lesion (Superior Labrum Anterior to Posterior). 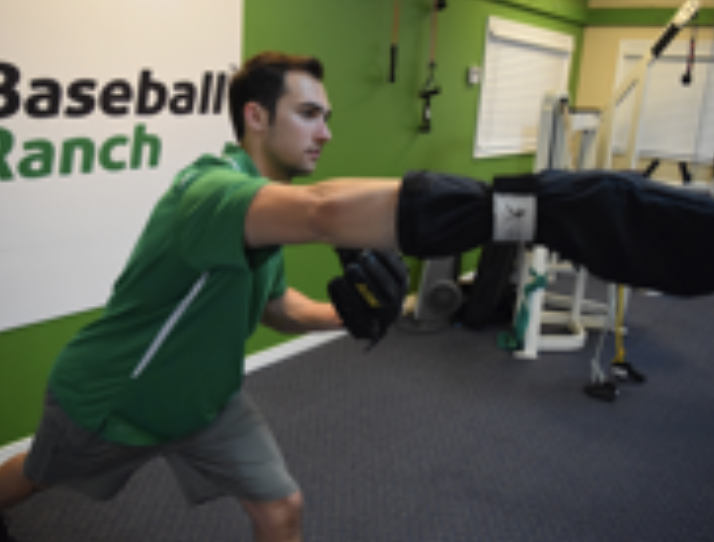 In my experience, a SLAP lesion usually starts as biceps muscle belly pain, then progresses to biceps tendinitis and, ultimately, a SLAP tear. The good news is this scenario is completely preventable. To prevent an overactive biceps from creating a labrum tear, all you need to do is provide support for the biceps by keeping the posterior cuff and periscapular musculature active through the endpoint of the throw (ball release), and you have to turn the biceps off. Turning the biceps off is the easy part. The natural throwing motion of shoulder internal rotation and forearm pronation (turning the forearm toward thumb) inhibits the biceps through a neurologic principle known as reciprocal inhibition. The Law of Reciprocal Inhibition: To activate any muscle or group of muscles involved in producing a movement, the muscle or group of muscles that oppose that movement must be inhibited. For example, if I’m going to bend (flex) my elbow using the biceps, brachialis, and brachioradialis, the triceps complex, which works to straighten (extend) the elbow must be inhibited. If the elbow flexors and extensors are both active, no movement of the elbow joint can occur. By rolling the throwing shoulder into internal rotation and the forearm into pronation, the biceps is effectively turned off, removing stress on biceps belly, the biceps tendon and the labrum. Try it for yourself. 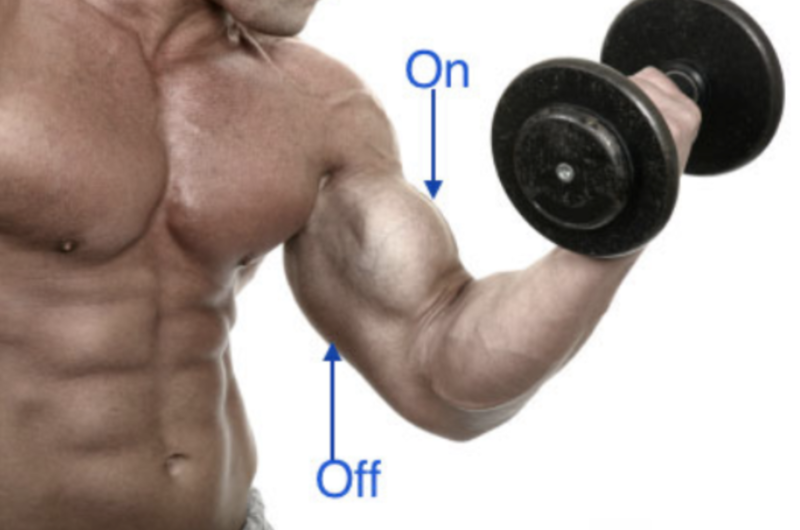 Hold your throwing arm up and flex your biceps as if you’re showing your wife or girlfriend the results of all the biceps curls you’ve been doing. Put your non-throwing hand on that biceps muscle and note the tone or tension. With your non-throwing hand still on the biceps, turn your throwing arm shoulder into internal rotation and forearm pronation — as if you’re dumping a cup of water on the ground just shy of arm’s length from your body. Did you feel the muscle tone disappear under your hand? That’s reciprocal inhibition. 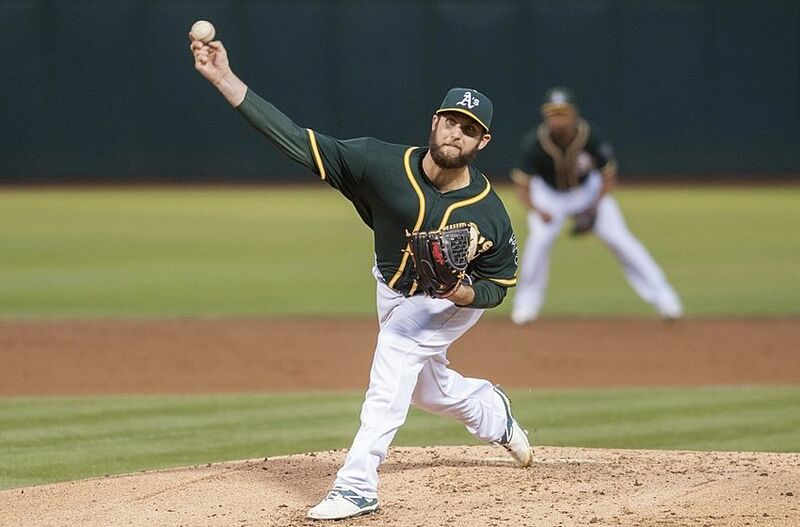 As I mentioned earlier, internal rotation and forearm pronation is the natural way to throw. From the time you stood up in your crib and started throwing baby rattles at your sister, to when you first tried to throw a rock or a football, you probably naturally internally rotated your shoulder and pronated your forearm. It’s such a natural move that even D-O-double G can do it. Supporting the biceps is a little more complicated. For years we’ve known that the muscles on the front of the shoulder were more powerful than the muscles on the back. Every pitcher, heck, every weight lifter has been told incessantly, “Make sure you work the backside.” The way we’ve done that for years has been … suboptimal. We’ve attempted to strengthen these muscles with things like elastic bands, rows, and reverse throws. Unfortunately, except for the brief moment when the arm is drawn back into the cocking position, that’s not how the posterior musculature works. Bands, rows and reverse throws involve concentric muscle contractions — the muscles shorten as they produce tension. As we discussed earlier, the biceps is most active, and therefore needs the most support, at ball release, when the posterior musculature is working eccentrically (lengthening as they produce tension. A critical concept in physical training and rehabilitation, the SAID principle is in play here. SAID is an acronym that stands for “Specific Adaptation to an Imposed Demand.” According to the SAID principle, the body will only adapt specifically to the demand imposed. In other words, you’re not going to learn to putt golf balls by shooting baskets, and you’re not going to strengthen your hamstrings by doing biceps curls. The demand must be specific to the adaptation desired. 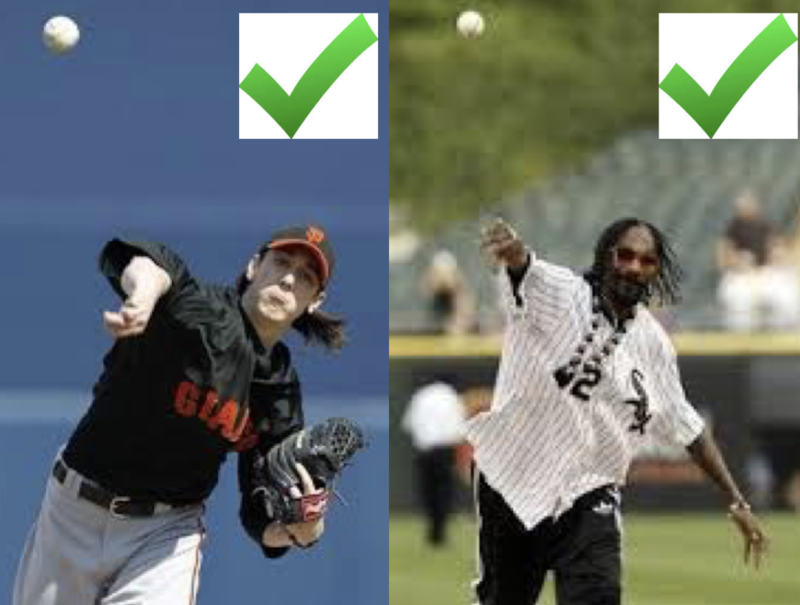 In the case of the posterior musculature in throwing, the adaptation desired is an eccentric contraction. Concentric training won’t get the job done. On the surface, it would seem that the solution to this dilemma would be easy — just do bands and rows eccentrically. But there is more to the specificity equation than meets the eye. The demands of training must also meet three other significant thresholds of specificity: rate of force development, speed of movement, and joint position/condition. For throwing athletes, the posterior musculature must be trained eccentrically, at high speed and while the shoulder is being distracted. To specifically train the posterior musculature, to support the biceps, and to encourage a deceleration pattern that reciprocally inhibits the biceps. we developed the Durathro® Training Sock. It’s a canvas sleeve that wraps around the athlete’s wrist. A small loop on the inside wall tethers the ring finger and index finger while the remaining fingers grasp a slightly overloaded ball (7 oz). The end of the sock is about four inches from the tips of the fingers. 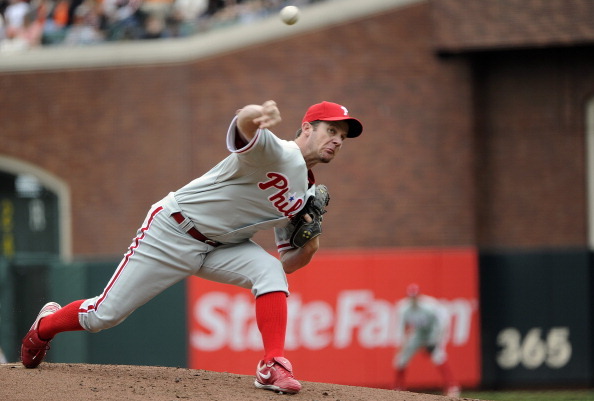 Using his normal, full-intent motion, the athlete throws the ball into the end of the sock. As the ball hits the end of the sock, the posterior musculature, still sensing the stimulus remains active through the entire deceleration phase. The ergonomics if the sock and the force of the ball impacting at the end of the sock encourages the shoulder to internally rotate. This inhibits the biceps, and securely seats the head of the humerus directly in the center of the glenoid fossa, thereby protecting the labrum and the biceps tendon. The magic is in the distance from the end of the hand to the end of the sock. If the distance were any greater, it would encourage a more corruptive linear pattern. Eccentric biceps activity can be a significant contributor to anterior shoulder pain: however, it can also have (sometimes severe) negative effects on the medial elbow. 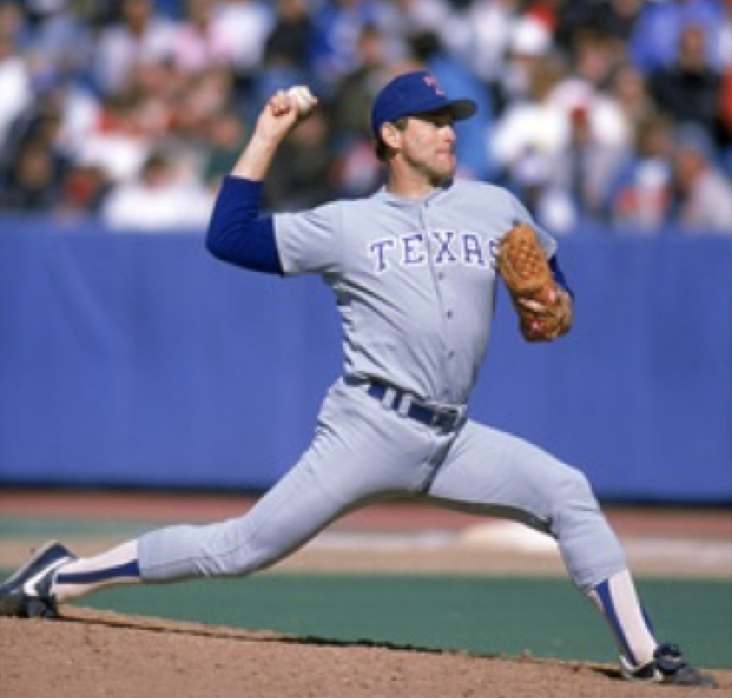 The UCL, also commonly known as the Tommy John ligament, resists valgus stress on the elbow. When the shoulder reaches full external rotation, it has been estimated that the UCL must accept up to 70 nM of torque. However, on cadaver studies, the UCL can be torn at only 35 nM of torque. So, in theory, the UCL should tear on every single pitch. Coordinated muscle synergies throughout the body must work together to attenuate UCL stress. A significant contribution to the attenuation equation can be found in the forearm. 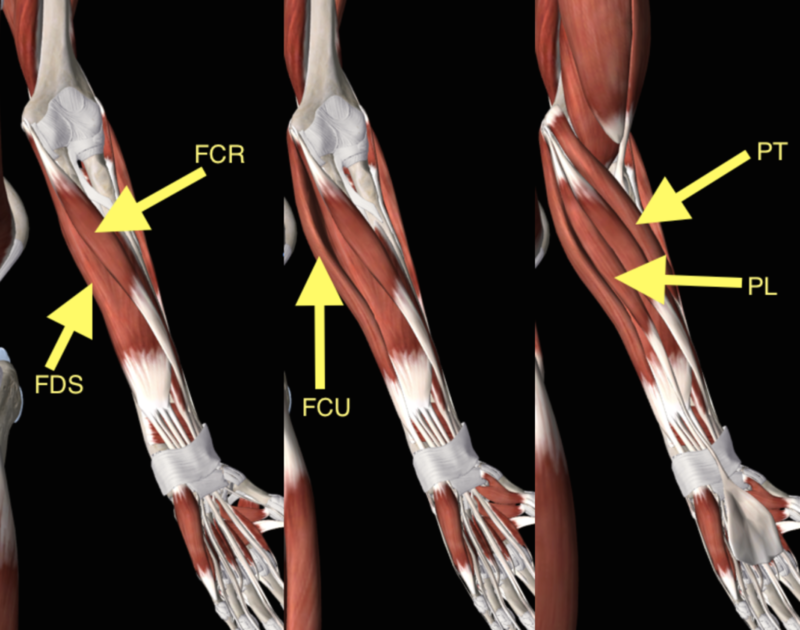 Four muscles: the palmaris longus (PL), the flexor digitorum superfiscialis (FDS), the flexor digitorum profundus (FDP) and the flexor carpi radialis (FCR) join in a common tendon to insert on the medial elbow directly atop the UCL. These muscles work to flex the wrist, flex the fingers and pronate the forearm. They have been called the primary stabilizers of the UCL. They’re commonly known as “the flexor-pronator mass.” In our practice, we refer to them as “first responders.” Because of their proximity to the UCL the first responders represent the first link in the kinetic chain of activity necessary to protect the UCL. When an athlete displays a linear deceleration pattern, the biceps remains eccentrically overactive. Linear deceleration patterns usually emerge in response to corruptive cues like “get extension,” or corruptive drills like the infamous Towel Drill. During a linear deceleration pattern, the biceps rages to resist long axis distraction, humeral head elevation, and terminal elbow extension. In doing so, it imparts a supination moment on the forearm. This reciprocally inhibits the first responders off and leaves the UCL unsupported as it hangs on to resist the valgus stress on the forearm as the elbow straightens and bangs across the midline of the body. Elimination or at least suppression of eccentric biceps activity is essential for protecting the labrum and the UCL. 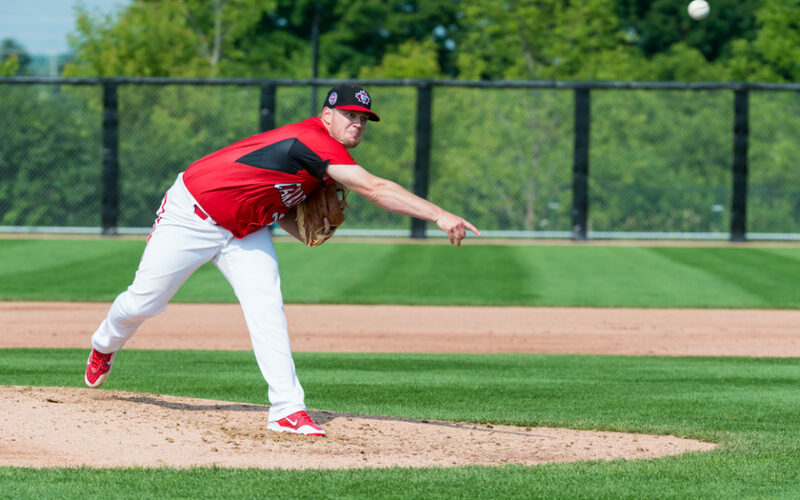 For this reason, safely and efficiently dissipating the energy of throwing through a rotational deceleration pattern is one of the seven attractors in pitching. For more on our revolutionary Dynamic Systems Theory approach to handling movement patterns, CLICK HERE . If you’d like to learn more about our services, and how we can help you achieve your dreams of increased veto city, improved command, and bulletproof durability, call us at 866-787-4533. 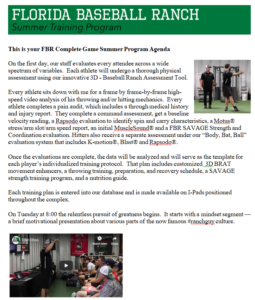 Weekend SAVAGE Training Camps: CLICK HERE.